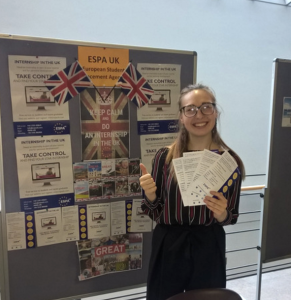 On the 15th– 17th November 2016 the ESPA team had a chance to participate and share internship opportunities in the UK with TH Nuremberg students. The aim of the International Fair was to enlighten students’ awareness about professional opportunities that would help to kick off their career and develop further professional experiences. Universities’ liaison Migle Serelyte had the honour of representing ESPA and of being the first speaker amongst many other international guests. “The presentation went smoothly, the students seemed to be very bright, keen, and interested in ESPA opportunities. In the end, they wanted to get to know more about ESPA process and asked plenty of questions. I was happy to be part of this event and getting to know the main students’ concerns and preferences in terms of choosing international internships” Migle S.
After the presentation, Migle had an information stand and was inviting students to register to ESPA’s website as well as sharing her own experience in the UK, and answering questions. At the end of the evening, TH Nuremberg International Office invited ESPA representative and other guests to a traditional German dinner. During the dinner Migle got a chance to discuss internships’ situation with global intermediaries such as DAI, BayCHINA, BayIND, BAYHOST, AIESEC, GOstralia, TravelWorks, CareMed and DAK. Besides that, cooperation with IAE Nice, Pucrs, Nottingham University and Bremen HS was established. ESPA is very grateful to the International Office of Nuremberg University of Technology and especially, Margit Lange for the invitation, warm welcoming and great International Fair where ESPA had an opportunity to spread the message about its professional internships, got to meet students and make significant memories. Hopefully, this further collaboration between ESPA and TH Nuremberg will successfully benefit to students, university, ESPA team and ESPA’s host companies.